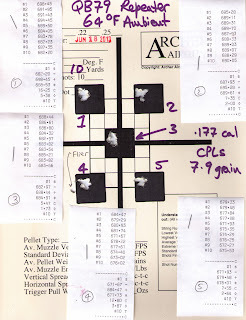 Here's the test target from our latest testing of a final specification preproduction QB79 Repeater in .177 caliber. It shows 5 groups of 10 shots each fired consecutively as one long string. (Click on the image to enlarge it for better viewing). As you can see, muzzle velocity hovered around the 680fps mark for 50 shots at 64 degrees F. This equates to 700fps at 75 degrees F, which is the specifications we will be using for the Repeater in this caliber. This is as close to steady muzzle velocity as we are likely to see and it's one reason for the excellent accuracy displayed in all the bulls. Well, except for that one flyer on target 4 - I'm blaming the pellet, but of course it could always be the shooter's fault! CNC manufacturing of QB78 Repeater parts is under way right now. Both complete guns and Upgrade Kits should be available in early July 2013. We'll be making announcements as soon as these exciting airguns become available!